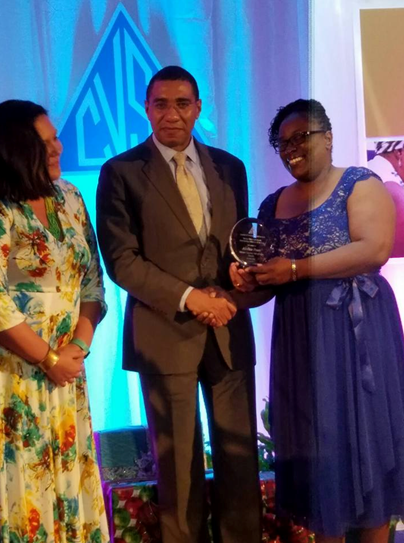 Alethia Carpenter Peart (right) accepts the Outstanding Volunteer of the Year Award from Prime Minister The Most Hon. Andrew Holness. At left is Saffrey Brown, General Manager of the JN Foundation, which is one of the sponsors of the Awards. Whether it is stunt driving, travelling 47 miles to hunt crabs at midnight in the swamps of the Salt River, or being immersed in watching boxing weekly on Direct TV, Alethia Carpenter Peart, Business Relationship and Sales Manager for the JNBS Mandeville Branch and Christiana MoneyShop, always experiences a great adrenaline rush. Despite these gratifying pursuits, what Alethia finds most fulfilling, however, is giving her time to improve the quality of life for other people, something she has been engaged in since she was a teenager. On December 9, 2016, she was the centre of attention at the Council of Voluntary Social Services National Volunteer Awards, held at the Jamaica Pegasus Hotel. At that event, she was presented with the Marion Ballysingh Outstanding Volunteer of the Year Award by Prime Minister the Most Hon. Andrew Holness. Alethia, a past student of Bishop Gibson High School, explained that she first became a volunteer at 17 years old, following a visit to the Mandeville Infirmary. “I was concerned about the needs I saw; and, therefore, wanted to make a difference each time I went there to deliver food and toiletries to the residents; as well as, help to feed them, and comb their hair. After that, I started doing other volunteer work,” she disclosed. Althea has spent the last 23 years of her life working with JN, which also provided her with opportunities to participate in outreach activities. “On the top of my list is the JN Foundation’s Member Advisory Council (MAC), which identifies beneficial projects in the communities. Each year, we identify a new project to support,” she pointed out. As an “I Believe” Ambassador and a Justice of the Peace (JP), Alethia is also an active member of several organisations, geared to implement outreach activities. 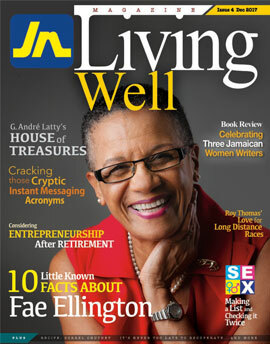 She is also a distinguished President of the Kiwanis Club of Junction; Chairman of the St. Elizabeth Poppy Appeal; First Vice President of the St. Elizabeth Chapter of the Lay Magistrates Association of Jamaica; Director of the St. Elizabeth Health Foundation; Secretary and Treasurer of the Governor-General’s Achievement Awards for St. Elizabeth;, and member of the St. Elizabeth Homecoming Foundation. She is also an active member of the Shiloh Apostolic Church in Manchester, where she worships. The JNBS employee also used the opportunity of accepting her award, to encourage her colleagues to get involved in volunteerism. “We should endeavour to use the skills we have learned to help to make life meaningful for other persons. By doing this, our living will not be in vain,” she maintained.